ABERDEEN ROYAL INFIRMARY, FORESTERHILL By 1990 the Foresterhill site had been so added to that the original complex of buildings were hard to distinguish. The new Royal Infirmary, designed by J. B. Nicol in 1927, lay at the centre of this ambitious scheme, the buildings were impressively severe and uncompromising in grey granite. The Infirmary has been a victim of its own success, it is sad to see such an important complex being submerged under unsympathetic extensions. Professor Matthew Hay, Aberdeen’s City Medical Officer of Health, conceived the idea of a medical complex, centralizing all the different voluntary hospital services for Aberdeen on one large site. The existing Royal Infirmary at Woolmanhill had been so absorbed into the city that there was no more room for expansion on that site. Hays’ Joint Hospitals Scheme was a bold and important undertaking, foreshadowing the scope of the National Health Service. It comprised the general hospital, a maternity hospital and children’s hospital, together with a nurses’ home and the medical school buildings of Aberdeen University. They shared services including steam for heating, kitchens, sterilizing and laundry facilities. The University undertook pathological, bacteriological and bio-chemical work for the hospitals. The foundation stone was laid on 28 May 1928 by the Prince of Wales and the Hospital was opened on 22 September 1936 by the Duke and Duchess of York. 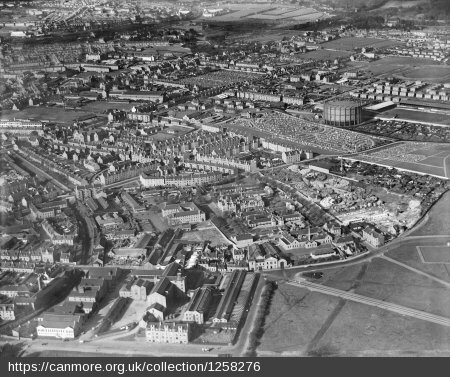 The Aberdeen Press and Journal gave an account of the opening ceremony in which it noted that there were 1,995 doors and 2,652 windows in the hospital. The doors were of ‘ultra-modern type, while special fittings were required for the windows which open inwards, and can be cleaned from the inside’. Local workmen were employed throughout. ABERDEEN ROYAL INFIRMARY, WOOLMANHILL The former Royal Infirmary designed by Archibald Simpson is an elegant neo-Classical granite building of 1840, near the centre of Aberdeen. Comparable to the earlier Gray’s Hospital at Elgin, it was designed as an impressive public building as much as a functional hospital. To the rear of Simpson’s block are two ranges, largely dating from 1887, which create a roughly triangular court. Just as the Infirmary at Woolmanhill was replaced nearly a century later by the Foresterhill complex, the Woolmanhill building replaced an earlier infirmary built a century before. 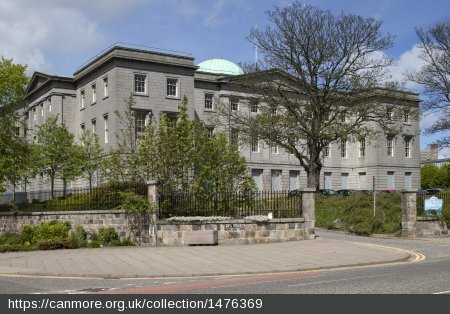 The Aberdeen Infirmary was founded in 1739 and the foundation stone of the first building on the Woolmanhill site was laid in January 1740. It was of simple construction, built to the designs of William Christall who had visited Edinburgh and Glasgow to view William Adam’s Edinburgh Infirmary and Glasgow’s Town’s Hospital, before completing his own plans. It opened in 1742, providing twenty beds, including accommodation for lunatics, and had cost £484. No illustration of this building appears to have survived. On the completion of Simpson’s new Infirmary the old building was demolished. In 1887 a major extension and reconstruction scheme was begun. The site formed an awkward wedge and added to this difficulty the managers wished to avoid interfering with the existing buildings. H. Saxon Snell, the well-known hospital architect in London, was consulted and at his suggestion Simpson’s building was converted into an administrative and clinical area, with new ward pavilions built to the rear. He also recommended retaining the separate fever block at the rear as part of the new surgical block. Known as the Jubilee Extension Scheme, the new blocks opened in 1897 and provided a new surgical block, medical block, pathology and laundry blocks. W. & J. Smith & Kelly, the Aberdeen firm of architects, carried out the work. It is perhaps worth noting that the Marylebone hospital referred to in London was in fact a workhouse infirmary. It is a measure of the changing attitudes to hospital and nursing provision for paupers that their nurses were offered better accommodation than those in a Scottish Royal Infirmary. Plans of Aberdeen Royal Infirmary published in H. C. Burdett’s Hospitals and Asylums of the World, 1893, portfolio of plans. Above the northern half of the site, with the new block on the left, and below the original building showing its new room uses. Ground plan of Aberdeen Royal Infirmary, from H. C. Burdett, Hospitals and Asylums of the World, 1893. 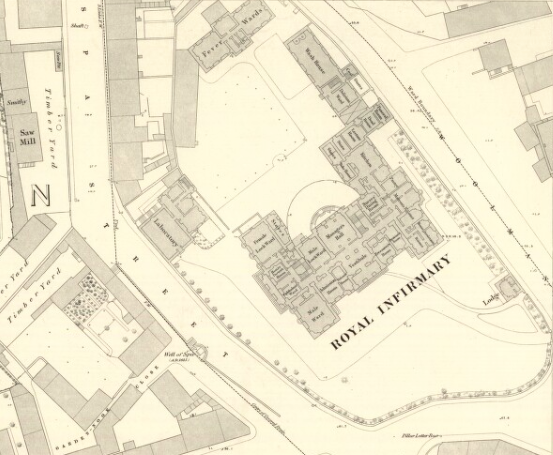 Burdett classified the layout and plan of Aberdeen Royal Infirmary as ‘composite or heap of buildings’, which was his class 4, class 1 being pavilion plan hospitals, class 2 block plan and class 3 corridor plan. There is a suggestion that the ‘heap of buildings’ class was the worst type. The plans were published before works on the new buildings had been completed. The out-patients’ department (demolished) was opened in November 1912, situated to the east of the infirmary on the other side of Woolmanhill. A large top-lit waiting hall was centrally placed off which were situated admission rooms, dispensary, Ear and Throat, Dental and Skin clinics, bacteriological and sterilising rooms, operating rooms for minor surgery, dressing and recovery rooms etc. A basement housed stores and heating chamber, and on the upper floor were two 4-bed wards for the Ear & Throat department and some staff accommodation. Extract from the 25-inch OS map revised in 1926. The out-patients’ block occupies the island site north of the Drill Hall, bounded by St Andrew Street, Woolmanhill, Andrew and John Streets. Reproduced by permission of the National Library of Scotland. ABERDEEN EYE INSTITUTION The Eye Institution was founded in 1835 by Sir James McGrigor, the Director-General of the Medical Department of H. M. Forces. Its early foundation may have been prompted by the frequency of eye injuries amongst the Aberdeen granite cutters. However, the need for such specialist hospitals had been growing in the country since the end of the Napoleonic wars, when a high proportion of the returning forces were found to be suffering from diseases of the eye. ABERDEEN ROYAL INFIRMARY CONVALESCENT HOME, Pitfodels Hill, Cults The Convalescent Home was designed by W. & J. Smith & Kelly of Aberdeen who were at that time engaged on the extension of the Royal Infirmary at Woolmanhill. It opened in 1897. More recently it became the Aberdeen Waldorf School. CITY HOSPITAL, ABERDEEN Before the City Hospital was built, infectious diseases were treated at the Royal Infirmary. 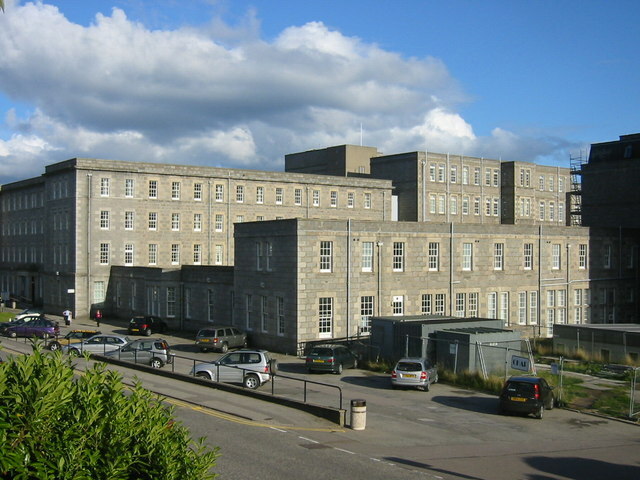 An outbreak of smallpox in the early 1870s prompted the Corporation to provide hospital accommodation which was initially established in a disused match factory. The first hospital, built on this site to designs by William Smith, began in 1874, some of which remains (as of 1990). It was constructed of concrete, with no wooden floors or walls, on the principle that the wards could be hosed down and completely disinfected. This was an early use of concrete in the construction of buildings, and the first time it is known to have been used for a new hospital in Scotland. There were four single‑storey pavilions with accommodation for 72 patients, together with a reception block, administration building, laundry and disinfecting station. Although the intentions were laudable that led the Corporation to choose concrete, the drawbacks were an exterior and interior that were ‘cold, cheerless and prison‑like, with cement everywhere on the floor, walls, and ceilings’. In 1887 a wooden smallpox pavilion was built and wooden floors put into the existing wards and wood panelling installed. In 1891 the Public Health Committee began to consider extending the hospital to meet the needs of the expanding city and in the following year members of the committee visited similar hospitals at Dundee, Edinburgh, Glasgow and Newcastle. John Rust, the city architect was employed to draw up plans for the extension which doubled the size of the existing ward blocks. Other improvements at this time included the installation of new sanitary arrangements, ventilation and heating systems, rearranging the administration building, providing extra stores, nurses’ bedrooms, laundry, waiting room, disinfecting block and mortuary, plus a new gateway and entrance lodge onto Urquhart Road. The new accommodation was opened in 1895. The ventilation system chosen for the hospital was of a mechanical propulsive type, whereby the air heated by steam pipes was driven by large Blackman fans into the wards. To work successfully the windows had to be kept shut and the nurses began to complain of the close atmosphere. The system was scrapped c.1911 and replaced by radiators. FONTHILL MATERNITY HOME, ABERDEEN A domestic house was taken over by Aberdeen Corporation in 1945 and opened as a maternity unit in 1946. Latterly it acted as an annexe to the Aberdeen Maternity Home. MORNINGFIELD HOSPITAL, 59 KING’S GATE, ABERDEEN Formerly the Aberdeen Hospital for Incurables, the hospital moved to Morningfield in 1884. It was founded in 1857 and opened in December 1858, in Belleville House, Denburn. The house had been purchased in January that year for £910. A new wing was added in 1867 for five consumptive patients and a further wing added in 1877. In November 1883 the hospital managers acquired the Morningfield site and plans for a new hospital were prepared by the local firm of architects, William Henderson and Son. 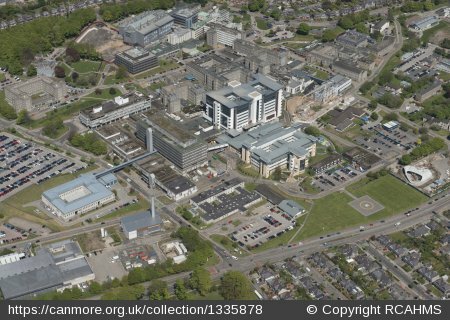 The building committee visited Longmore Hospital, Edinburgh, and Broomhill Hospital, Kirkintilloch before the plans were finalised. The new hospital opened in August 1884. First-floor plan, from H. C. Burdett as above. In 1891 a new wing and a porters lodge were added and in 1901 a new dining hall and recreation room were opened. During the First World War the hospital was used to accommodate wounded soldiers (see edinburghs-war.ed.ac.uk for a photograph of Belgian soldiers and nursing staff outside the hospital). OLD MACHAR POORHOUSE, FONTHILL ROAD The poorhouse was designed in 1853 by William Henderson for the accommodation of 200 paupers. The new poorhouse replaced a smaller building which had been operating since 1848 following the decision the previous year not to unite with St Nicholas Parochial Board to build a joint poorhouse. Old Machar Board most probably adapted an existing building, as already in May 1848 they were recommending the acquisition of additional premises to provide better accommodation for the inmates. By the early 1850s the poorhouse held on average around 80 to 90 paupers, but there were over 200 paupers ‘on the books’, the majority of whom were given out-door relief. A larger poorhouse was advocated that could accommodate all 200, on the grounds that it would reduce the cost per-head of maintaining the parish poor as well as deterring people from applying for relief. It was also cheaper to house mentally ill paupers within the poorhouse than to place them in the Aberdeen lunatic asylum at a cost of £13 p.a. per patient. But the provision of a new larger poorhouse was by no means unanimously desired. A committee was appointed by the Old Machar Parochial Board to erect the new building. The Building Committee reported in August 1853 that they had considered three sites, eventually opting for the one at Ferryhill, offered by William Clark, ‘late ironmonger’, who held the ground on a 999-year lease from Martinmas 1756 and under-let it to a market gardener. The lease was purchased by the Board for £451. Plans and estimates for the new poorhouse were advertised for, and five sets submitted, several exhibiting ‘considerable merit’. After much deliberation the plans submitted by William Henderson were selected on the grounds that they seemed to offer the most economical and efficient accommodation, at the lowest cost. Henderson was currently engaged in preparing working drawings and specifications so that tenders for the building work could be invited. ROYAL ABERDEEN HOSPITAL FOR SICK CHILDREN, FORESTERHILL The hospital at Foresterhill opened in 1928 and was the first new hospitals on this site and the only one of the 1930s development not designed by J. B. Nicol. The plans were drawn up by William Kelly who had been associated with many Grampian hospitals, including the Jubilee extensions at Woolmanhill. ROYAL CORNHILL HOSPITAL, ABERDEEN In 1797 lands at Clerkseat were purchased and a small asylum was opened there in November 1800. Additional cells were soon provided, and improvements made in the segregation of male and female patients in 1809. By 1818 there were 63 patients in the asylum and larger premises were needed. An adiditonal three acres were purchased and a new building for 150 patients erected, designed by Archibald Simpson. The Hospital continued to expand gradually. Clerkseat House was built in 1852 as the medical superintendent’s house, but it soon became necessary to house patients there due to overcrowding in the main building. In 1855 a chapel was built. The managers of the asylum had decided, after the 1857 Lunacy Act, to provide accommodation for the whole of the paupers in the county, thereby acting as the District Asylum. The increasing number of patients lead to the establishment of Elmhill House in 1862 following the acquisition of the adjoining estate. In 1888 the estate of Glack, in Daviot parish, was purchased with 283 acres of land and two mansion houses and a country branch of the asylum was set up. Elmhill House, designed by William Rammage, was set in extensive pleasure grounds, laid out with terraces and drives. The accommodation combined security with the appearance of freedom, and was varied to provide some suites of apartments. Elmhill House around 1914, from the Aberdeen Handbook and Guide of that year. In 1888 two mansions, the old and new houses of Glack at Daviot, were acquired as an annexe to the hospital (see under House of Daviot in Aberdeenshire). With the removal there of 100 patients the Asylum managers turned their attention to the original site and the buildings were upgraded in 1892, and a new hospital for sick and acute cases built to the north in 1896. Furhter additions were made in 1898, with a new laundry and female day room and dormitories. Aberdeen Royal Asylum in about 1914 from the Aberdeen Handbook and Guide published in that year. During the 1920s TB pavilions were introduced and verandas added to some of the existing buildings. In 1931 Wellwood House at Cults opened under the direction of the asylum for early and transient uncertified patients (see separate entry below). During the 1930s the hospital was remodelled and Elmhill house converted into a nurses’ home. When Kingseat Hospital was requisitioned by the Admiralty during the Second World War, many of the patients were transferred to Cornhill. The Cornhill site sustained bomb damage in 1943, with four fatalities. Elmhill House was severely damaged as well as wards and the laundry at the main site. This large H-plan poorhouse to the north of Aberdeen was designed by Thomas Mathews and James Mackenzie, adapted from their model plan of a poorhouse of 1847 for the Board of Supervision. SUMMERFIELD HOSPITAL, ABERDEEN (demolished) Summerfield Hospital functioned as an annexe of Woodend Hospital. It was built for patients of the Aberdeen district of the county and was originally situated well outside the town – just to the north-east of the poorhouse. It opened on 24 August 1900. When the city boundaries were extended in 1934, Aberdeen Corporation took over the hospital and carried out extensive renovations, reopening it in 1937. However, it became a maternity hospital under the National Health Service. It closed in 1991 and has since been demolished, on the site now stands offices of NHS Grampian. THORNGROVE HOME, ABERDEEN A converted private house on the outskirts of Aberdeen for abandoned and convalescent children. Aberdeen Town Council took possession of the house at Whitsunday 1933. Initially it was used for the accommodation of unmarried mothers in their first pregnancy. WOODEND HOSPITAL, ABERDEEN Woodend Hospital was constructed as a Poor Law Institution. Designed by the local firm of Brown & Watt, it opened on 15 May 1907 and was one of the last poorhouses to be built in Scotland. It was originally known as Old Mill Poorhouse and a separate infirmary block was provided behind the main building with accommodation for 220 beds and there was a further Special Hospital for infectious diseases. 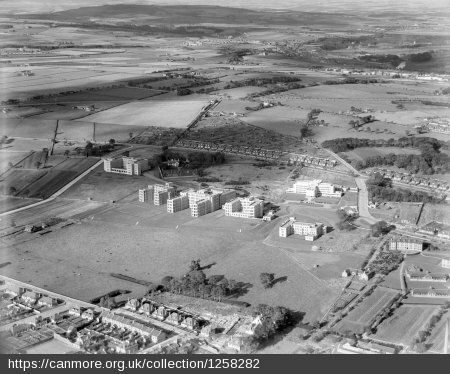 The complex compares with Edinburgh’s Craiglockhart Poorhouse and Glasgow’s Govan Poorhouse (Southern General Hospital) in the general size and degree of classification provided for the different groups of paupers, although lunatics were not included at Oldmill. There are similarities in the general layout and composition with the dominant central water‑tower in a long two‑storey range and separate hospital and children’s departments. The original buildings on the site form an impressive group which have retained many of their contemporary features. The grey granite is enlivened on the hospital block by the glazing patterns of the upper sashes. The water‑tower on the poorhouse block is elaborately turreted and decorated with a diminutive cupola and the projecting bays are linked at ground level by an arcade at the centre and verandas elsewhere. During the First World War the institution was taken over as a Military Hospital (from 24th May 1915 to 1st June 1919). In 1926 the hospital sections were taken over by Aberdeen Town Council and re‑opened as the Woodend Municipal Hospital in October 1927. Postcard of Woodend Hospital dating from the First World War when it had been taken over as a military hospital. The card shows a concert being given in front of the main entrance block. WOODLANDS HOSPITAL, CULTS Woodlands House, of about the 1860s, was purchased by Aberdeen Corporation in May 1947. Plans for alterations and additions were prepared by Charles Clark Wright in 1951. It is a substantial but plain house given individuality by a corner drum tower with a decorative ironwork circlet. It was initially used as a home for 50 mentally handicapped children, opening in 1948 after having transferred to the National Health Service. It was the only institution of its type in the North-East region and was extended in 1952 (Rocklands Cottage, adapted for 12 boys) and 1954 (50-bed extension). Pingback: WOODEND/SUMMERFIELD HOSPITAL, ABERDEEN | WHERE IS THE OUTRAGE?? i looked up this site as i was born at Forresterhill in 1947. I am told i was in an incubator. But i would like to know if my family had to pay for the birth there ?? I did my nursing training at ARI hospital group. Hi, does anybody know how/where I can find out more information about Woodlands Hospital, Cults? I’d like to find photographs or information about its history before it was converted to residential use. If someone died in 1854 and is recorded as place of death : ‘Dead house’ St Clements School Records’ Aberdeen, where would this have been? and would this person have died in a poor house? Looking for info about Aberdeen maternity hospital at 50 st Clements street in 1917, but none here. Info welcome. Thanks. Maybe I am interpreting a death certificate wrong, but the one from 1917 I am looking at says died at “Maternity Hospital Aberdeen (xxxx-a word I cannot read)” then on line below “50 St Clements Street”.The cause of death was eclampsia. That is odd, the key may be in the word you cannot read – if it were ‘from’ for instance? I’d be happy to take a look if you wanted to send a photo of just that part of the certificate. Harriet – Death certificate attached (as a .png and also as a .doc). I am looking at the middle entry 638. As well as looking at the address of death I would also be interested to know what the word under eclampsia is (if you know). My interest in this is that I am looking into the death of my grandfather’s (George Brown) first wife who died in childbirth. I am fairly but not absolutely certain this is her. He was very unlucky. He married my grandmother several years later and their first born (also George) died of a twisted bowel as an infant. Very sad. Thank you Ally, I’ve emailed you a reply direct, let me know if it doesn’t get to you.